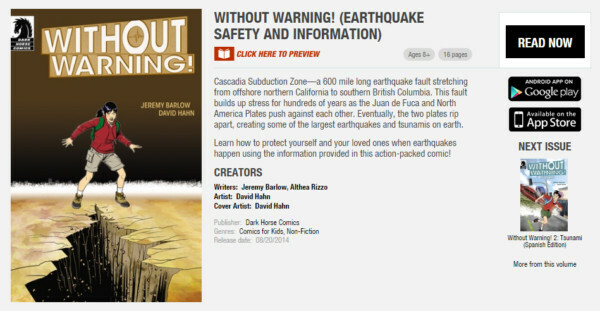 Oregon’s Office of Emergency Management and Dark Horse Comics released their newest collaboration just in time to prepare for the Great ShakeOut. This 16-page colorful story sequence teaches tsunami preparedness. SALEM, Ore. — Oct. 12, 2016 — Oregon’s Office of Emergency Management and Dark Horse Comics team up to prepare for the Great Oregon ShakeOut on October 20 and introduce Without Warning: Tsunami, a new comic touting tsunami preparedness. The 16-page comic strip sequence chronicles a mother/daughter camping trip on the Oregon coast when an earthquake and resulting tsunami strike. The duo stays safe and helps others in danger. Rizzo came up with both stories. Dark Horse Editor Shantel LaRocque then worked with writer Jeremy Barlow and artist David Hahn to have them scripted and illustrated. Without Warning: Tsunami was released on October 12 and available online at http://bit.ly/2dWuS0G. Printed copies can be obtained through local county emergency management offices.